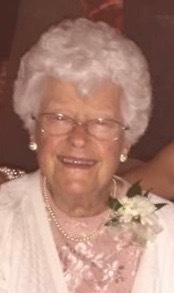 Mrs. Rita Marie Casey, born on July 25, 1929, departed on Tuesday, January 15, 2019 at the age of 89. Daughter to Mary and John Doherty of Winthrop, MA. Sister to the late David, Frank and Margaret. Mother to the late Thomas Casey. Rita is survived by her loving husband of 65 years, Fred Casey and children Paul and Denise, William, John and Elizabeth, Ann, Robert and Gretchen. Also survived by 12 loving grandchildren Victoria, Alexandra, Shaelyn, Brendan, Ryan, Sean, John, Ashley, Joseph, Michael, Robby, Ana and two great grandchildren, Landen and Logan. Mrs. Casey was an avid reader and retired librarian of both the Boston Public and Winthrop Public libraries. She valued education, as she attended the University of Massachusetts, Boston for Library Sciences. Rita was also a passionate member of the Winthrop Catholic Woman’s Club. She was an enthusiastic gardener, tending to her hydrangeas and begonias with the greatest of care. Rita spent many summers on the Cape at Sippewisset Campgrounds, as well as beloved winters in Fort Myers, Florida where she enjoyed the sea, sun, and sand. Her love for her family and her faith is as beautiful as the life she led and loved ones she left behind. Rita quietly departed this life on Tuesday, January 15th, 2019 surrounded by the love, peace and support of her family. Her beautiful life will forever be cherished. Family and friends are cordially invited to attend the visitation from the funeral home on Friday, January 18, 2018 from 9:00 to 11:00 AM followed by a funeral mass in St. John the Evangelist Church 320 Winthrop St., Winthrop at 11:30 AM. Committal will be private.